All joking aside. I was talking to Jameel and the most disturbing part of the Winograd report is what is NOT being discussed by anyone. Overall it appears that conclusions of the report was that the military was unprepared, but more significantly, the political echelons were completely indecisive and unskilled when it came to using the army and defending the North. 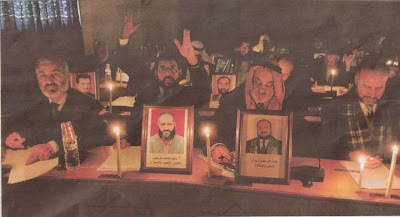 One opinion was that they should have launched a major strike against Lebanon’s strategic resources, and another was that a major ground offensive should have been launched – in either case, it should have happened in the first few days, and the war shouldn’t have been let to drag on with no results and no decisions for such a long time, including even deciding if it was a war in the first place. But is the situation in the Negev any different? Missiles are flying at Jewish cities and towns, and the army has its hands tied by the political echelon, restricted to limited attacks, and low-intensity conflict, as opposed to either a major ground offensive or major strikes strategic targets. There is no real difference. The lessons leading to Winograd haven’t been learned. A very good analysis can be found on Ben-Chorin. Highlights of the report in English can be found here. It appears that Olmert has easily survived the Winograd report, and will be able to easily brush off any feeble citizen protests that may arise (not that citizen protests have any effect in this country). The report states that ultimately Olmert’s decisions weren’t based on political expediencies or motivations, just incompetence. The report said, of all the branches, the Air Force performed exceptionally well (and the minor mistake there was merely the over reliance on its strategic capabilities). It is no longer clear to me why Halutz had to quit in the first place. After all, Halutz built up the air force, so they said he did a good job there. And when he was made Chief of Staff (after Boogie was fired) he was told that his primary mission was to kick Jews out of their homes, not to defend the country. He did his job there too. And everyone knows that you don’t make an air force guy a chief of staff. They are incapable of understanding the strategic and tactical limitations of their forces. He should have just been right-sized back into the air force. Like Olmert, he was just out of his league, that’s not reason to fire the guy. Poor guy. He was just in his job for 2 months. Why is he responsible for an army that didn’t have supplies, logistic procedures, or soldiers who had been trained to fight? In fact, just a year or 2 before, the IDF declared the Disengagement to have been the most logistically complex, tactically difficult and multifaceted military campaign the IDF or any modern army had ever successfully completed. And we all saw the shiny new uniforms and shiny new equipment they got for kicking Jewish children out of their homes. Obviously, the IDF was up to par. So certainly, the fact that the army was in such bad shape could not have been his fault either, he had no way of knowing. In fact he just said so again today. But that really isn’t the point, is it? So let us let bygones be bygones. Now that that stumbling block is passed, its time Olmert can get back to politicizing the army, and for him to use it to throw more Jews out of their homes. Ahh, nothing like business as usual. It is a pleasure to drive through Judea and Samaria. Besides the stoning and drive-by shootings committed by our Arab enemies, the only other major problem is the lack of a good radio station. Radio West used to be excellent, but they were Jerusalem only. And personally, I never was able to get into Arutz-7’s choice of music that much. Even national Israeli radio stations are smothered out by the proliferation of local Arab radio stations grabbing and overwhelming all the used and unused frequencies. Not that there is anything to listen to on Israeli radio anyway, unless you like listening to the openly-biased, left-wing opinions of their interviewers and broadcasters. So, due to the law allowing regional radio stations to open, the effort of Shas MK Attias (one of the few doing anything for those outside his constituency) and the application by people from Yesh(a), a permit will be issued for RadioSH (Radio Ye”sh). Of course, this is subject to the IDF regional commander approving it, and all the upcoming court cases that the Left are planning to try to block it with. So sorry that we all happen to disagree with your politics, but amazingly enough, despite your above statement, we also happen to principally disagree with your culture, anti-religious beliefs, and anti-Israel social circles and foreign donors. And as much as you try to delegitimize us, we represent a “segment of Israeli society”. Amazing, this Leftist is concerned that if the “extreme Right” (which actually represents the views of half this country) gets a radio station, then the Left should get one too, as if they don’t have a whole bunch already. I guess it scares them that an opposing message may get out, and people will not be forced to hear the drivel of the Left everywhere in this country anytime they turn the radio on. I’m looking forward to a new driving experience. Now if only we could get satellite radio in this country, then they could even hear it in Tel Aviv. The Winnograd is due out tomorrow. There are reports that indicate a major snow storm is on the way. The Winnograd committee is demanding the roads be clear so they can deliver the report. Olmert is probably calculating if the snow is good for him, or bad for him. If the roads are difficult to travel on, less people will be able to go out to protest in Jerusalem, if it is too cold out, people won't go to the streets, and if it is a blizzard, everyone will be too busy playing in the snow. No one will be preoccupied with work that day, so they will go out and protest. So, does he plow the highway or not? Preliminary reports indicate that 2 of the terrorists in last night's attack were recently released from (Israeli) jail. Thank you Olmert, May we have another? The JoeSettler family went out today for a quick and spontaneous regional tour of the Gush. Mostly we had to get the kids out of the house after being cooped up the past few days. We picked 2 random villages and learned some interesting things. 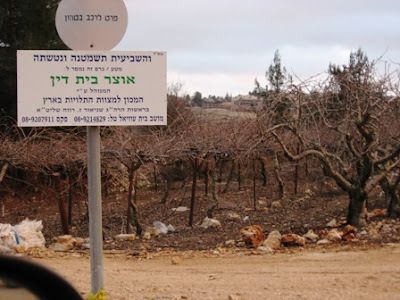 Driving through Rosh Tzurin and Masuot Yitzchak we learned that these two farming-oriented communities are part of the Otzar Beit Din with regard to Shmita. Very cool. We continued along a long and winding dirt road and suddenly came upon a wooden house in the woods. Turns out it was a restaurant. We finished up with dinner, sitting by the wood burning stove at the rather enjoyable Gavna restaurant and bar. I recommend the Gnochi (and Wednesday evenings is Jazz night). May we all be inscribed for a year of good fruit. In other news, the JP is reporting that the delay in the satellite launch I mentioned yesterday was actually due to covert pressure and sabatoge attempts by Iran to halt the launch. There was an interview this past weekend with an IDF general where he actually mentioned that Israel is working on methods to defend our Space resources whch have become more and more important, and more and more under direct threat. 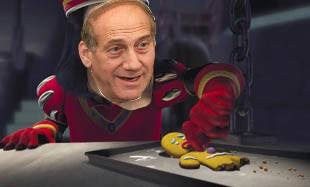 "Oh George, together we'll make Duloc Jerusalem perfect, just like you." It's always nice to be able to post good news. 1. The remaining girls have been released from their illegal, immoral and politically-based incarcertation by the Israeli government. 2. 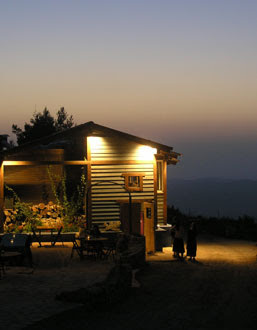 The population of Judea and Samaria grew by 5.2% (14,000) residents in 2007. I'd like to thank one of my children for being part of that number. 3. Olmert is temporarily holding strong and keeping the Gaza blockade up (we'll see how long that lasts). 4. An advanced Israeli spy satellite was just successfully launched on an Indian rocket. This satellite was meant to be launched last September, but it is believed that an Unnamed State put pressure on India to not allow the launch back then. ...Who gave you those subversive pamphlets published by the Center for Near East Policy Research at the Beit Agron International Press Center in Jerusalem and distributed under the auspices of the National Council of Young Israel ?" So, the court decided that it was the obligation of the police to identify the girls they are holding incarcerated all these weeks, and not the obligation of the girls to identify themselves. The next day the police were in the houses of 3 of the girls, grabbed their photos and other identifiers, and surprise, they could now identify the girls. Amazing how they knew which homes to go to, after claiming they didn't know the identity of the girls. Instead of going all out against the Kassam fire from Gaza and the Gazan government, the Olmert government has decided to restrain and arrest the residents of Sderot. On Thursday night, no longer able to quietly take the government’s inaction and emasculated and constrained responses to the expanding rocket barrage against them, residents of Sderot began a large spontaneous protest demonstration against the government. You gotta love that one. One of the coolest things about Israel, is that not only are we living through history as it happens, but that pieces of our history from thousands of years ago always seem to pop up. This latest find, by Israel's premiere archeologist, Dr. Eilat Mazar, is of an ancient seal from 2500 years ago that mentions the name of a family that was listed in the book of Nechemia. Sniper from Gaza shoots and kills farm volunteer from South America working in a Negev Kibbutz. Document Forensics Specialist declares that the Hebron Peace House was definitely sold to the Jews as all the documents support it. Calls the police’s work in this matter “substandard” and questions how the police let themselves be tricked by the Palestinians who used a simplistic, obvious, and well-known ruse to try to confuse them. 3000 residents of Sderot have abandoned their homes. JoeSettler home receives an army pamphlet discussing what to do if you are at home during a missile attack. The wife suggests they supply us with pamphlets on how to build rockets to shoot back at them. IDF stops 2 tons of bomb making chemicals/rocket fuel from making it into Gaza. Chemicals were again disguised as “Humanitarian Aid”. There is a general disagreement as to what would have been better to have built, concentrated settlement blocs in a few fixed points, or dispersed, smaller settlements and outposts. Both were actually built. 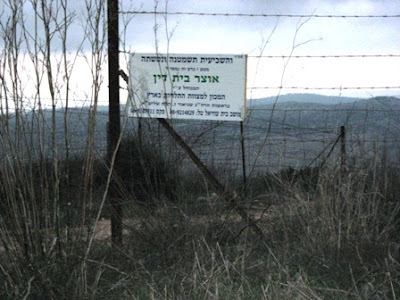 On one have we have cities like Ariel and Maaleh Adumim, and settlement blocs like Gush Etzion (actually made up of smaller dispersed villages), and we have dispersed smaller villages and “outposts” (like the Gilad Zar farm). The argument for concentrated settlement blocs is that supposedly they are harder to give up, whereas smaller, dispersed towns are easier for Israel to divest from. After watching Israel expel the residents of the Gush Katif bloc, and the Northern Gaza settlements (adjoining the green line), I think that argument is rather flimsy. Once the Left gets the strength to destroy, they aren’t particularly concerned whether it is a big bloc or small sites they are destroying. Look at Har Homa, that’s a serious neighborhood (and inside Jerusalem too), and the Left can’t wait for the opportunity to rip it down, once it’s permitted. On the other hand, smaller dispersed settlement give us more control over larger swaths of Eretz Yisrael with fewer people. All it takes is one house and that region is effectively liberated and conquered. Furthermore, when the army has the assistance of local Jewish villages, then controlling a sector becomes much easier. Compare how difficult it is for the army to operate now in Gaza without the backup and support of Gush Katif. And of course, it may actually be more difficult for the left to uproot many small and dispersed villages, as opposed to large blocs. As for the kids building and rebuilding their outposts – good for them. That is exactly what is needed if we are to win in this war. Duloc Jerusalem is a perfect place. One need only imagine how Jerusalem looked to George Bush. 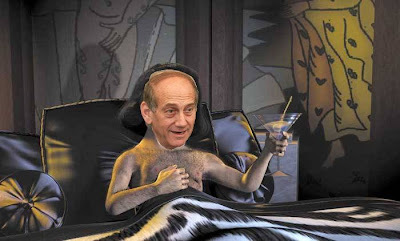 After all, Lord Farquaad Ehud Olmert really went out of his way to make sure that George’s view of Jerusalem was perfect. And I’m not talking about the change in the lighting schedule for the walls, the suddenly clean streets, and the lack of traffic (for certain people at least) in this crowded city. I’m talking about how any signs of dissent and opposition was suppressed. I’m talking about how people were arrested, so that George Bush wouldn’t see them holding up a protest sign. I’m talking about how not a single negative political advertisement could be seen anywhere in Jerusalem (where George might see it). Of course, there were a few Ogres that tried to ruin the party. Ogres like Itamar ben-Gvir and Susie Dym who had the nerve to hold up posters and hand out information booklets questioning the policies being pushed forward. And Gingerbread men like Eli Yishai who dared to talk to George Bush about releasing Jonathan Pollard, particularly after Ehud Olmert specifically warned Yishai to keep his mouth shut on the subject. And someone did manage to get a few Jonathan Pollard advertisements running, but nothing particularly serious. In short, Ehud Olmert managed to turn Jerusalem into a perfectly totalitarian Duloc. While George Bush is trying to spread democracy in Iraq, Ehud Olmert is killing democracy in Israel. This anti-democratic government has decided that in light of Bush’s visit to Israel, all basic democratic rights are to be thrown out the window. I’m surprised he hasn’t declared martial law. People have been arrested and detained for nothing more than hanging up posters, holding up posters, and now, even giving out information booklets to reporters. Yesterday, Susie Dym and 2 other volunteers were harassed, detained and arrested by the police for giving out an information booklet that details Abbas’s governments involvement in terrorism. So that you don’t think that this is some sort of right-wing crackpot document, let me explain that it was published by the Center for Near East Policy Research at the Beit Agron International Press Center in Jerusalem and distributed under the auspices of the National Council of Young Israel – most likely the organization your shul is chaptered under. And if you think they were trying to give it to Bush or Rice and were breaching security barriers to do so, you’d be wrong. They were quietly standing outside the Dan Panorama hotel, giving it out to foreign journalists staying there, so the journalists could get a better background and perspective of the real facts. But that is the problem. The real facts are not what the Olmert government wants people to hear, so they will use any illegal and anti-democratic methods to silence any opposition. It's official, Rice has announced that the US considers Jerusalem neighborhoods "over the green line" to be settlements. Can we please now tell Bush to go home and stop interfering in our country? As I read this article, I thought to myself, "What a joke." Not that I don't expect them to do it, but more because there were supposed to be international observation forces on the Egypt-Gaza border, and look how fast they ran after the first sign of trouble. Now the US is thinking of sending troops the West Bank to secure the area after Israel is forced or chooses evacuate more of our country? Let's see. They aren't thinking of sending troop to Gaza, much less the Gaza border, yet we are supposed to take them seriously that they will actually send troops into Shchem to find and stop bomb factories, and suicide bombers? The US probably looks at how many of their soldiers dies every week in Iraq from suicide bombers, and how many Israeli soldiers don't die every week from suicide bombers and reached the wrong conclusion that a patrol in the Nablus Kasbah will be a piece of cake. Of course that isn't what they are thinking. They aren't planning on sending US troops at all. They are thinking of NATO troops, or Jordanian and Egyptian troops. Egypt and Jordan couldn't beat us militarily, so through "peacekeeping" they will get to place their heavily armed troops inside our borders en masse. What I don't get is if he is already planning on putting Jordanian soldiers on Israel's soil, then just give the "Palestinians" Jordanian citizenship already, and follow it up with Benny Elon's IsraelInitiative plan. The reality is, this whole idea of theirs is an admission of failure. It means that the Palestinians cannot and are incapable of controlling their own destiny and lives, and this is the US and Israel's way of not having to admit that publicly. So, instead of a workable solution, here is yet another very bad idea. “Every Solution Will Be Painful” - A statement by PM Olmert in an interview this past weekend with the Jerusalem Post. I understand the Left. They want every solution to be painful… to the Right. They look at it as a way of punishing those who dare rise up and disagree with them. Better to hurt your political (and spiritual?) opponents than your physical enemy. There is enough documented articles and commentaries from the Expulsion that attests to that fact. But it’s the New Left that confuses me. Once the “Center” or the “pseudo-Right”, these “New Leftists” have knowingly swallowed the mantras of the Left – even as they know full well the lies and falsehoods these mantras are based on. Lies such as fictitious demographic statistics from fabricated Palestinian disinformation centers, and dishonest arguments that purposely jumble the lines between demographic basins, strategically defensible borders and armistice lines – just to give 2 examples. Or worse, the knowledge that true and viable alternatives exist – solutions that needn’t be painful. Those on the Left like to say that the line has moved. What was once Left is now Center. The Line hasn’t moved. Right is still right, and Left is still wrong. What has moved is not the imaginary “Center” but moral posture of those who once defended this country and Jerusalem in words or actions. As much as Olmert might protest, the fact is, he has let the Left win, even in Jerusalem. Where once there was consensus on Jerusalem on such places as Gilo, Abu Tor, Pisgat Zev, the Jewish Quarter (not to mention Har Homa and Ma’aleh Adumim), Olmert has allowed the door to be open on all of Jerusalem. As much as he might protest his innocence, he has let the Left lead him down that slope of evil, where the discussion is no longer about (currently) predominantly Arab neighborhoods of Jerusalem (as he has given up on that entirely), but on our rights to the completely Jewish neighborhoods of Jerusalem. 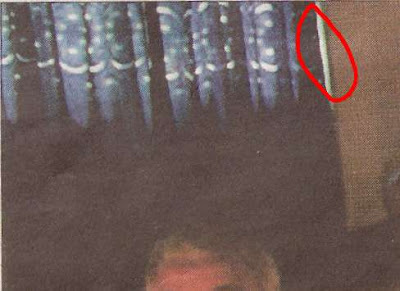 That door is open, and he hasn’t made any, but the feeblest of symbolic attempts to shut it. Like Sharon, Olmert recently made the ridiculous statement that as Prime Minister he is privy to State Secrets that give him superior insight into what is going on behind the scenes – while we simple citizens know nothing, and should therefore completely and passively trust his judgment and decisions, no matter how bad it may look to us. There is only one thing wrong with this argument. The Prime Minister receives his information from multiple sources (not one secret source that no one else was involved in). And enough people on different sides of the political spectrum are privy to the same exact information. For instance, Netanyahu has access and receives the same reports. While his backbone isn’t strong enough to maintain his moral positions under pressure, he manages to reach completely different conclusions from Olmert (and the Left) when he isn’t being forced to concede under blatantly nontransparent political pressures. In fact, enough political and military analysts, both within and outside of the government, reach opposing conclusions with the same data. In short, one’s moral position and moral strength (and perhaps criminal background) are the deciding factor in how to interpret the data. No painful solutions are needed, unless you personally need them. 1) The Expulsion would improve Israel’s international image. 2) The Expulsion would reduce the demands for Israel to make territorial concessions. A study was recently completed by 2 researchers at Hebrew University. They discovered, by reviewing thousands of statements by leaders, politicians, ministers and newspapers, that the exact opposite of the above claims has since occurred. 1) Israel’s international image is far worse now than before the Expulsion. 2) There is a stronger and increased demand on Israel to make further “territorial concessions”. Now to those of us who properly protested the Expulsion, this reaction is quite expected. To those who believed those nonsensical claims before the Expulsion, I’m sure they’ll find some excuse to pooh-pooh these finding. We’ll continue to build our lives and towns, and walk through all of Israel. And they'll continue to try to destroy everything good. No news here at all. I haven’t written about the murder of the two boys this past Friday because I don’t really know what new perspective I can offer on it. As was just revealed, the Arab terrorists were members of the PA security forces, and they used weapons supplied by the US whose transfer was approved and authorized by the Israeli government. No surprises there. I wonder if Bush will mention that on his trip to Israel this month. What more surprises me is that reactions by some in the Jewish community. I honestly don’t know if it is even possible to dignify those questions with an answer. I don’t understand how they can compare hiking in Israel to walking through Washington Heights (and why is it always above 125th St. - aren't there other dangerous areas in the US?). I don’t understand people that criticize someone for living in what they perceive to be a “dangerous area” in Israel. It’s Israel. If we don’t fight for all of it, we will lose all of it. It is an all-or-nothing proposition, because our enemy isn’t after a diminutive state in the “West Bank and Gaza”, they are after everything. A suicide bomber was caught in Tel Aviv this past Yom Kippur. The Dolphinarium in South Tel Aviv was blown up and children killed. Should we also abandon this front line community and question the intelligence of parents who let their kids ride the buses in that town or go to clubs (with knives)? These boys were armed and took reasonable precautions (not that that should matter). What happened to them could just as easily happened in a drive-by shooting on the road, a knifing at a checkpoint, a bomb in a hotel, or an airplane into a skyscraper. They aren’t the problem and they aren’t the cause. The problem is that the government is choosing to abandon the entire country, not just the “West Bank”. The Gemorah describes a situation where a frontier/border town is robbed (could someone please find me the source). The reaction called for is an extremely disproportional response compared to what would normally be permitted or required. The Gemorah doesn’t ask what these people are doing living there. The Gemorah doesn’t ask why are they are putting their lives at risk. The Gemorah doesn’t tell them they must leave because of Pikuach Nefesh or Makom Sakanah. No, the Gemorah realizes that they are fulfilling the necessary task of protecting the interior cities just by their presence and hiking, and if the frontier towns fall or weaken, then the big cities are next. I wish our Jews knew that too.